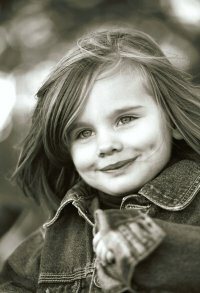 ippa Hart specialises in black and white portraits of children and family groups. Her natural and informal style of photography suits an outside environment. Her home in The Lee provides an ideal location for her work; and wherever possible she chooses to use this as her “outdoor studio”. typical session normally takes an hour. Pippa takes as much time as necessary to let your children relax and does not put any pressure on them to perform - the most natural shots come when children are happily playing and not posing for the camera. This informality is of course less easy to achieve with group shots or small babies. ippa charges a set Sitting Fee. Because film and processing are then charged to you by the roll there is no restriction on the number of photographs that she is willing to take on the day of your booking. A typical session with one or two children would require approximately two films/72shots – additional children and family groups obviously require more film. ithin a week to ten days after the sitting you will receive a slip-in album containing Machine Printed Black & White Proofs of all of the shots taken – these proofs are for you to keep; they form a lasting record from which you can chose the photographs you would like to order. ll orders will be Hand Printed on gloss paper and are available in the following sizes: 7” x5”, 8” x 6”, 10”x 8”, 12”x 10”, 16” x 12” and 20” x 16”. They will be printed with an 1” border to suit your framing requirements. If you would like more information about having your child or family photographed, please contact Pippa.